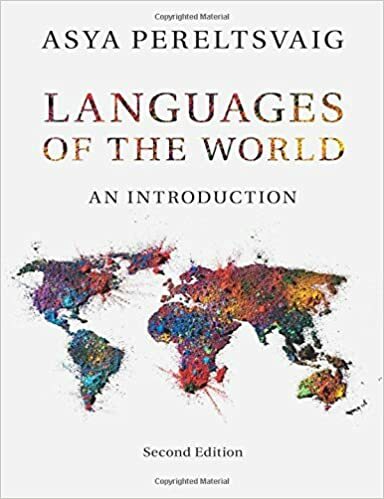 However, such jokes are more revealing of the Russians’ own xenophobia and – as we shall see below – lack of basic knowledge of the Chukchi lifestyle and beliefs than of any real peculiarities of the Chukchis themselves. 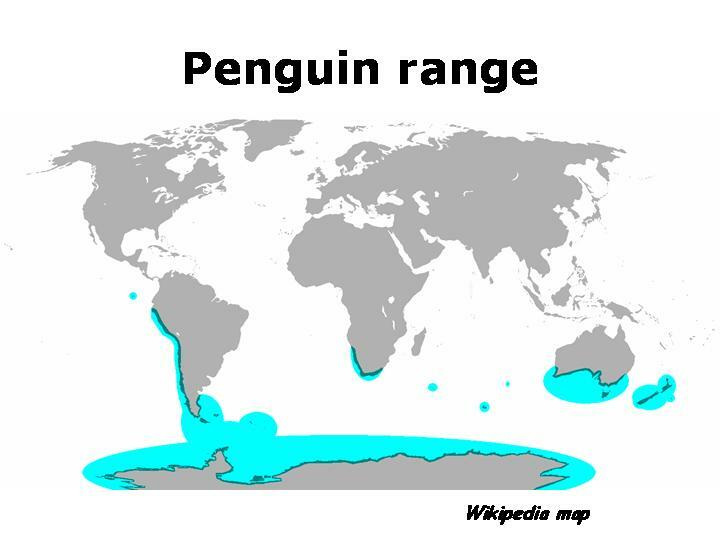 “Good idea,” says the Chukchi and whizzes away towards the zoo. After a while the traffic cop sees the Chukchi again. 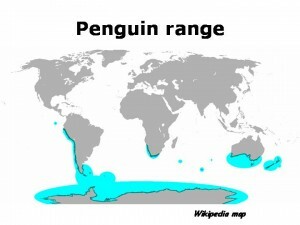 His pickup is still full of penguins. I [the Russian teacher] said that all over our country the new life had now been established… as a result of the revolution led by Lenin. 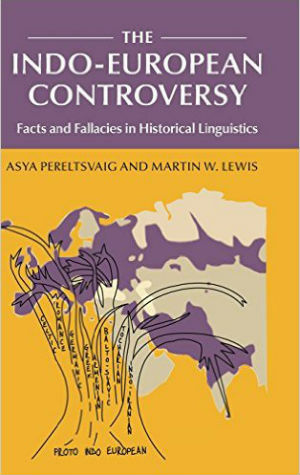 Not only were the Russians ignorant about the Chukchi belief system and their natural environment, buy they also failed to understand the ethnic composition of the Chukchis people. The failure to understand the differences between the Reindeer Chukchis and the Maritime Chukchis is responsible in part for the lack of success of the Soviet collectivization program in Chukotka. While the Russians established nearly equal number of collectives (totaling about 40) for the two Chukchi groups – reindeer herders and sea-mammal hunters – the success rate of the collectivization for the two groups was quite different. The so-called “cooperative grazing associations” formed among the Reindeer Chukchis by 1933 were embraced by only 3% of the population, as compared with the 60% collectivization rate of the coastal people. By 1939, about 95% of the coastal Chukchi people had enrolled in Soviet collectives, but the percentage of collectivized reindeer nomads had increased only to 11%. Almost 90% of all reindeer were still privately owned as late as 1941. The great majority of Reindeer Chukchis remained entirely outside the collective system, turning their backs on the benefits of modern civilization offered by the Russians and adhering to the traditional ways of nomadic life. The paternalistic attitude depicting Chukchis as stupid, naïve, and child-like pervades not only Russian humorous folklore and early Soviet propaganda. Consider, for example, the Russian 1966 film “The Chief of Chukotka”, a comedy set in 1922. A patriotic young man is sent by the Revolutionary Committee to Chukotka, where he intends to spread ideas of justice and equality among the natives, but as it happens, he learns instead the local capitalist ways and starts a profitable fur trade with American, Japanese, and other merchants. In the film, the Chukchis are presented as a peaceful people. In one scene, they refuse to shoot at the enemies of the Soviet regime, saying that “arctic fox we shoot, people no”. 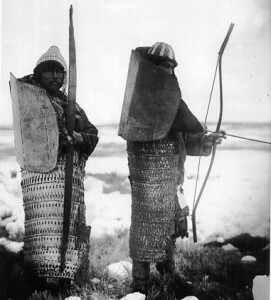 However, in reality Chukchis were noted among other Arctic groups such as Koryaks and Eskimos as formidable warriors. Even barter and trade encounters between the Chukchis and their neighbors often ended in bloody duels, which were conducted on a piece of walrus skin, smeared with blubber, stretched over ground and nailed down by sharp bone fragments or stones. The goal of the dueling fighters was to throw the opponent onto those sharp bone or stone pieces, often with fatal results. The wars between the Chukchis and their southern neighbors the Koryaks, which continued well into the eighteenth century even in the face of the Russian menace, are recounted in the historical records. The Chukchis used bows and arrows, poisoning their arrowheads with plant toxins. Pieces of walrus and sea-lion skins were used to make defense shields that looked like tortoise shells (see image on the left). However, the bravest Chukchi warriors were expected to forego such a clumsy, heavy, and inconvenient armor. This fearsome nature of the Chukchis was not lost on the Russians, who waged a sanguinary war against them for 120 years without success. The encounter between the two peoples began in 1640s, when the Russian Cossacks first reached the Kolyma and Anadyr rivers. Contact at first was rather limited, mostly because the Chukchis were poor in fur, the main desire of the early Russians adventurers. Fighting flared up around 1700 when the Russians began operating in the Kamchatka Peninsula and needed to protect their communication lines from the Chukchis and Koryaks. Four expeditions were sent out in the first decade of the eighteenth century, resulting in considerable bloodshed but little success. The Russians renewed their efforts under the command of Major Dmitry Pavlutsky, who adopted brutal tactics of killing Chukchi men, driving off their reindeer, and capturing women and children to be sold as slaves. Pavlutsky was only too happy to follow orders from Saint Petersburg that the Chukchis and Koryaks were to be “totally extirpated” (in Russian, iskorenit’ vovse). However, the genocidal war proved difficult carry out, as the Chukchis defended themselves bravely. Prisoners of war killed each other, preferring death to slavery. The war continued throughout 1750s, despite Pavlutsky’s death March 1747; according to several sources, the Chukchi kept his head as a trophy for many years. Only with Catherine the Great’s ascension to the throne in 1762 did the policy change. It became clear to some Siberian officials that savage attacks served merely to arouse the warlike spirit of the Chukchis. Moreover, maintaining the fort at Anadyrsk had cost the Russians over a million rubles, while the profit from the area amounted to less than thirty thousand rubles. The fort in Anadyrsk and the forcible gathering of tribute were therefore abandoned in 1764. The Chukchis, no longer provoked, began to trade peacefully with the Russians. The following episode further illustrates how clueless the Russian authorities in Saint Petersburg were about the Chukchis and their mode of life: to inform foreign ships that Chukotka belonged to the Russian Empire, huge imperial coats-of-arms were sent to the region in 1788, and the Chukchis were ordered to fasten them to trees along the coast. Alas, the authorities in the capital had no idea that Chukotka had no trees. 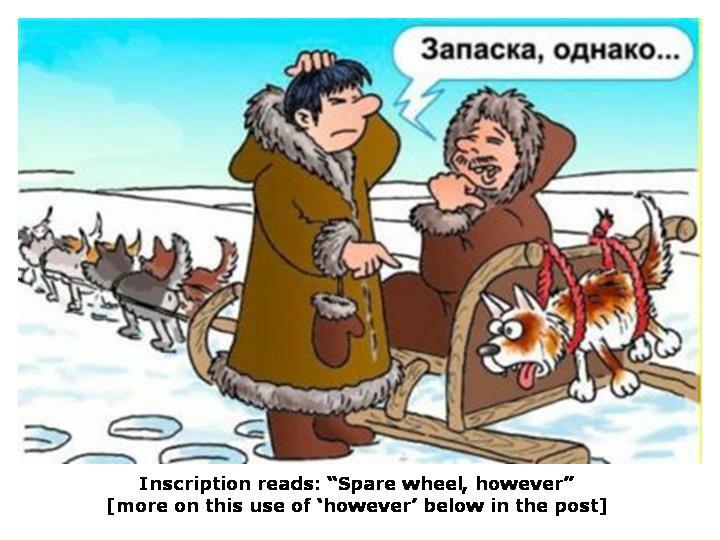 * Curiously, these Russian jokes fairly accurately reflect certain linguistic peculiarities of the Chukchi language, such as its reliance on evidential particles (cf. Aikhenvald & Dixon, Studies in evidentiality, p. 300). Such particles indicate whether something is known via direct visual evidence, via hearsay, or via indirect inference. 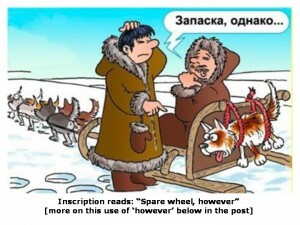 This peculiarity of the Chukchi language translates into the jokelore Chukchi’s overuse of the Russian word odnako, meaning literally ‘however’, but used in contexts where this Russian word makes no sense as such.